Once I read a story about a 10 year old Jewish boy named Felix who lived in Poland in 1942 and I felt a terrible sadness as I read. Once is very poignantly narrated by Felix. He tells the reader that he had been placed in a Catholic orphanage by his parents, booksellers in Poland, and has lived there for three years. He also tells the reader that he likes to make up stories and is considered by others to be quite good at it. Felix always carries a notebook in which he writes down his stories and hides it inside his shirt for safekeeping. Once he found a whole carrot in his soup and told himself that it was a sign that his Mum and Dad were coming back to get him. But they never show up. 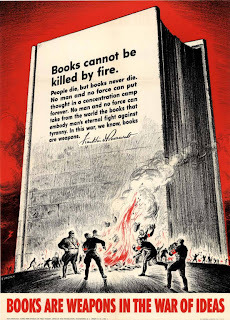 When Nazis suddenly show up at the orphanage to burn the books in the library, Felix remembers the time they destroyed the books in his parent’s bookshop and reasons with himself that the Nazis are only after books. He decides to leave the orphanage and find his Mum and Dad, to warn them that their books are in danger. In the distance I hear faint gunshots. The reader of course knows why the house is empty and what the gunshots are even if Felix doesn’t. Not just because I’ve made a suffering Jewish man feel upset at the sight of a crazy kid. Also because I’ve got a horrible suspicion I know the answer to the question. Maybe it’s not just our books the Nazis hate. When Felix and Zelda finally arrive in the city, they are taken into hiding by a dentist who is already taking care of several other children whose parents have been put on transport trains. The dentist, Barney, is a character modeled after a man who actually did take care of Jewish orphans. Janusz Korczak was a Jewish children’s doctor and well known author. When the Nazis rounded up the orphans he was caring for to transport them to Treblinka, they offer Korczak sanctuary. He refused to leave the children, choosing instead to go to his death with them. In his Afterword to Once, Gleitzman explains that Korczak became his hero after reading about him. Once is the story Felix tells us about his life as a child in this particular time and place in the history of the Holocaust. 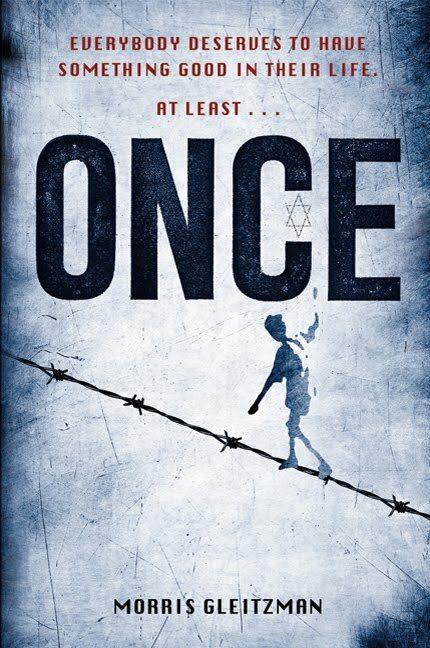 His journey to find his Mum and Dad also turns out to be Felix’s journey from innocence to realization about the situation of Jews under the Nazis. The book is geared for readers aged 11 and up and I would highly recommend it for that age group. Younger readers, even those who have high reading levels, may still find it too disturbing. I was told that I would want to immediately read the next two books, Then and Now, in the trilogy Gleitzman has written about Felix and that has certainly turned out to be the case. Unfortunately, they are not available in the US yet. So much of Once centers around the idea of storytellers and storytelling. 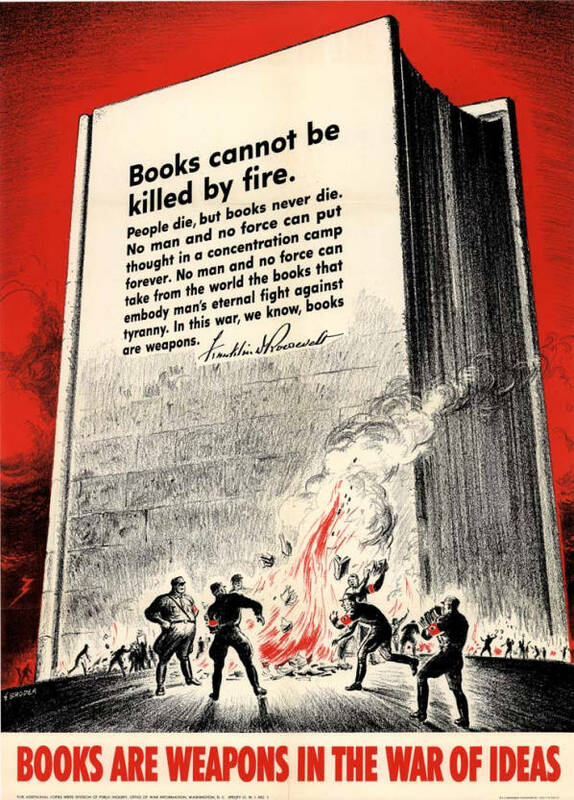 It reminded me of the poster that bore a message President Roosevelt sent to the American people about the Nazi book burnings. So glad to see you also thought highly of this one! Thanks so much for sharing that poster--I had never seen it. Thanks, I am glad you like the poster. This really was a small, but powerful book.